He must have already taken and passed ART100 and ART102. Likewise, he can have passed ART199 OR be enrolled in that course concurrently with his enrollment in ART201. He is in pursuit of the Visual Arts specialization. He needs to have earned a minimum of 24 credits. As a corequisite, at the same time he enrolls in ART201, he must enroll in ART200. During online enrollment periods, students will only be able to enroll in courses for which they have fulfilled the prerequisites. Academic Admins and Registrars can enroll students in any course whether or not the student has met the prereqs. You can set up some prerequisites when first creating a new catalog course. You can set up all prereqs and coreqs on the catalog course page. These instructions will work in both places, but they refer directly to the catalog course page. Click edit next to Prerequisites. Courses: Type a course name or abbreviation and select from the results. Then choose whether the course must be taken previously or may be taken concurrently. Finally, click Add. Course groups: Enter the number of courses students must pass, and then select the course group from the drop-down. Finally, click Add. Credits/hours: Enter the number of cumulative earned credits/hours a student must have. This is how you restrict the course to students with certain standings—for example, if you want Sophomores to take the course, you'd enter the minimum credits for Sophomores as established in your Undergraduate program. 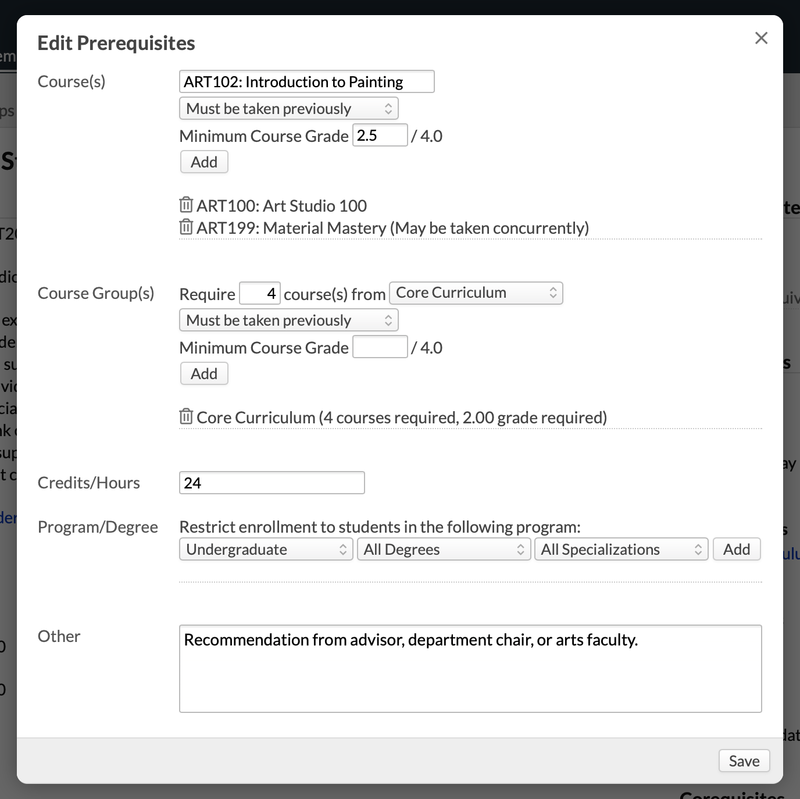 Program/Degree: Select the program, degree, and specialization from the drop-downs and click Add. Other: This is simply a text field that lets you list other prereqs. There is no way to automate what you enter here; you'll need to keep track of these manually. Click to remove any of the above (except for Other). Corequisites are set up on the catalog course page. Click edit next to Corequisites. Type a course name or abbreviation and select from the results. Repeat this as often as you need to. Remember that the student must enroll in every course you list here in order to enroll in this particular catalog course! Click to remove a course. When you add a course with corequisites to an academic term, make sure you also add those corequisite courses. Courses in need of corequisites will display on the Courses report with (when all the coreqs have been added, the warning will disappear). Prereqs can be fulfilled by a course equivalent. If you require ART101 to get into ART102, and DRAW101 is an equivalent to ART101, then students who pass DRAW101 can enroll in ART102. Prereqs and coreqs restrict the student's (and the student's advisor) ability to self-enroll in courses on Profile > Registration. They do not restrict Academic Admins and Registrars from enrolling the student in such.